The content in and accessible through this site, including newsletters and other materials requested by you through this site: (i) is for informational purposes only and does not constitute legal advice, and (ii) is not intended to create, and your receipt and/or use of such content does not create, a lawyer-client relationship. You should not rely on any such content without first consulting a licensed attorney familiar with your particular facts and legal issues. 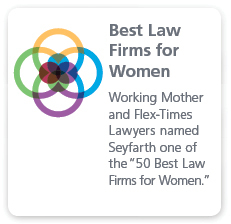 Any e-mail or other communications sent from you to us through the site will not be treated as confidential unless Seyfarth agrees in advance to treat it as such. Accordingly, do not send us any information about any matter which may involve you unless and until we have formalized our agreement to represent you. The entirety of the content in this site is a collective work owned by Seyfarth and is protected by U.S. and international copyright laws. Copyright 2011 Seyfarth Shaw LLP. All rights reserved. All elements comprising this site, including without limitation, the text, site design, logos, graphics, icons and images, as well as the selection, assembly and arrangement thereof are the sole property of Seyfarth or its licensors, and are protected by U.S. and international copyright laws. All software used in this site is the property of Seyfarth or its licensors, and such software is also protected by U.S. and international copyright laws. Permission is granted to electronically display and electronically copy and print hard copy portions of this site for your own non-commercial use. Any other use, including the reproduction, modification, distribution, transmission, republication, display or performance of any content of this site is strictly prohibited. The trademarks, service marks, trade names, trade dress, logos, designs, and sounds associated with the site are owned by Seyfarth or its licensors. Without limiting the foregoing, ONE MINUTE MEMO®, TRADEMARKVIEW®, SEYFARTH SHAW AT WORK® and SEYFARTH SHAW are trademarks or registered trademarks of Seyfarth. THE SITE, ITS CONTENTS AND THE SERVICES AVAILABLE ON THE SITE ARE PROVIDED ON AN "AS IS" AND "AS AVAILABLE" BASIS WITHOUT REPRESENTATION OR WARRANTY OF ANY KIND. SEYFARTH EXPRESSLY DISCLAIMS ALL REPRESENTATIONS AND WARRANTIES, EXPRESS OR IMPLIED, OF ANY KIND WITH RESPECT TO THE SITE, ITS USES AND THE SERVICES OFFERED ON THE SITE, INCLUDING BUT NOT LIMITED TO WARRANTIES OF FITNESS FOR A PARTICULAR PURPOSE, NON-INFRINGEMENT, TITLE, ACCURACY AND FREEDOM FROM COMPUTER VIRUSES OR OTHER HARMFUL COMPONENTS. Some states do not allow the disclaimer or limitation of warranties, so the disclaimers set forth above may not apply to you. IN NO EVENT SHALL SEYFARTH, ITS PARTNERS, OFFICERS, EMPLOYEES, AGENTS, REPRESENTATIVES, SUPPLIERS OR CONTENT OR SERVICE PROVIDERS BE LIABLE FOR DAMAGES OF ANY KIND, INCLUDING WITHOUT LIMITATION, DIRECT, INDIRECT, COMPENSATORY, SPECIAL, INCIDENTAL, PUNITIVE AND CONSEQUENTIAL DAMAGES EVEN IF MADE AWARE OF THE POSSIBILITY OF SUCH DAMAGES, WHETHER IN AN ACTION UNDER CONTRACT, NEGLIGENCE OR OTHER THEORY, ARISING OUT OF OR IN CONNECTION WITH THE USE, INABILITY TO USE OR PERFORMANCE OF THE SITE AND/OR ANY CONTENT, MATERIALS OR SERVICES AVAILABLE AT THE SITE. Some states do not allow the disclaimer or limitation of damages, so the disclaimers set forth above may not apply to you. Access to certain portions of this site (for example, accessing the TRADEMARKVIEW® services), may involve the use of a unique user name and/or password. You are solely responsible for maintaining the security of such user names and passwords, and will promptly notify us if you believe such security has been compromised. You will not use the user names and/or passwords of any third party without such party’s express prior consent. You will not misrepresent your identity or any other information when communicating with Seyfarth through the site. Seyfarth may provide links to websites operated by third parties. Seyfarth makes no representations whatsoever about any third party websites that you may access through this site, and the fact that we have linked to another site should not be construed as an endorsement or that site or its proprietor. 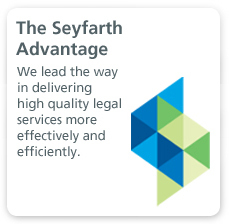 Seyfarth is not responsible for the privacy practices, terms and conditions or content of such websites. Seyfarth prohibits (i) the framing of any materials available through this site, and (ii) "deep linking" to pages of the site other than the home page. Seyfarth reserves the right to disable any unauthorized frames and specifically disclaims any responsibility for the contents of any other websites linked to this site. By sending Seyfarth any ideas, comments, suggestions, questions or other material, you grant Seyfarth an unrestricted, royalty-free, worldwide, irrevocable license to use, reproduce, display, perform, modify, transmit and distribute such material in any manner, including in connection with Seyfarth’s business, and you also agree that Seyfarth is free to use any ideas, concepts, know-how or techniques that you send us for any purpose. You agree that no comments or other information submitted by you to Seyfarth will violate any personal or proprietary right of any third party (including, without limitation, copyright and trademark rights). You agree that no comments or other information submitted by you to Seyfarth will be libellous, obscene, harassing, abusive or otherwise unlawful. You agree that you shall remain solely liable for the contents of any comments or other information submitted by you to Seyfarth. You agree to indemnify, defend, and hold harmless Seyfarth, its partners, officers, employees, agents, representatives, suppliers and content and service providers from and against all losses, expenses, damages and costs, including reasonable attorneys fees, resulting from any violation of these terms and conditions or any activity related to your account with Seyfarth (including negligent or wrongful conduct) by you or any other person accessing the site using your Internet account, Seyfarth site user name or account password. Your use of the site shall be governed by the laws of the State of Illinois without regard to its choice of law principles. You agree to submit to the personal jurisdiction of the state and federal courts located in Cook County, Illinois with respect to any legal proceedings arising out of these terms and conditions or your use of the Seyfarth site. Seyfarth reserves the right to make additions, deletions or modifications to the site and those services offered at the site at any time without prior notice to you. These terms and conditions were posted on the date set forth above. 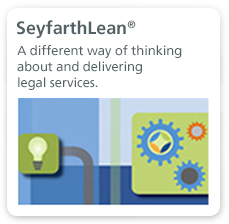 Seyfarth reserves the right to change, alter or modify these terms and conditions for any reason at any time. When we do so, changes in these terms and conditions will be posted on our site and will be effective immediately. If you are a regular visitor to this site, we recommend that you check these terms and conditions on a regular basis.